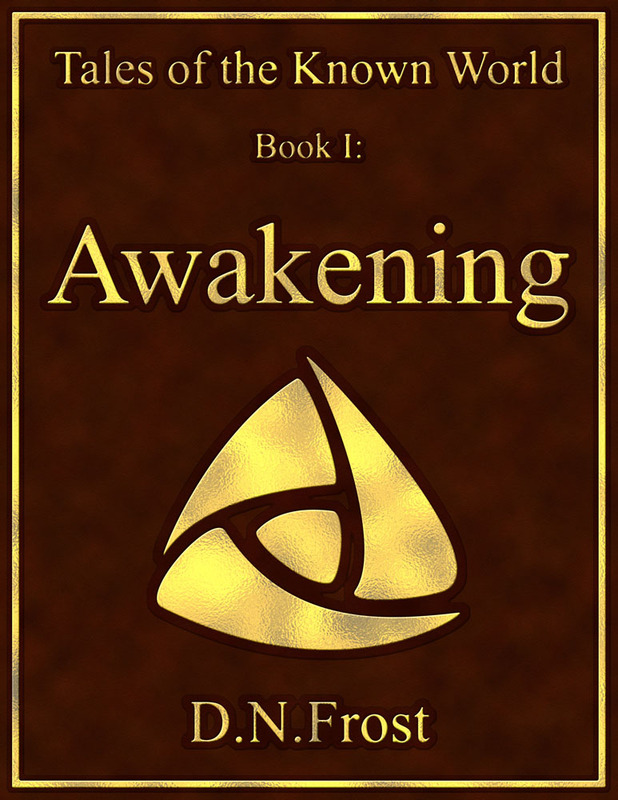 This post is Part 2 of a series to augment the Fictional Cartography by D.N.Frost available for free download. Start with Part 1 here. After Steve and I discussed his unique world in Part 1 of this series, the next step was to iron out the shape of his continents. 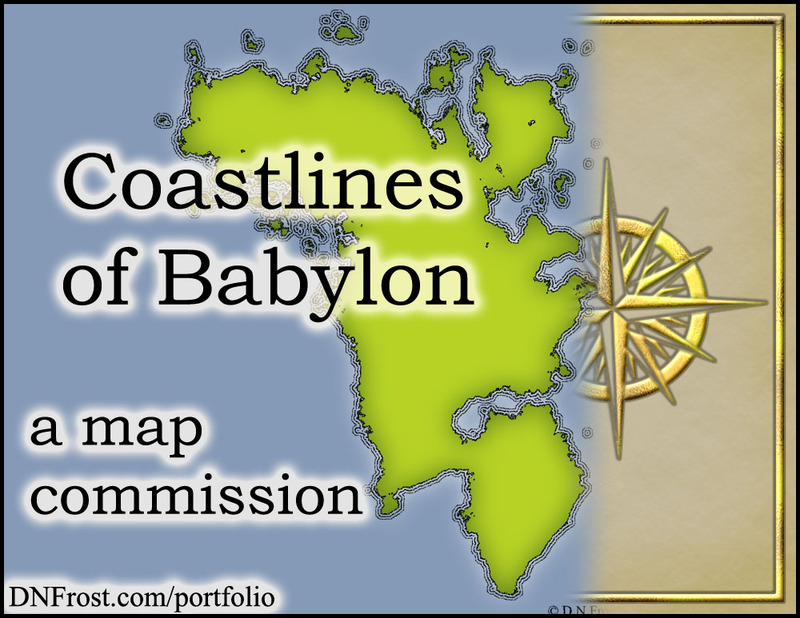 His initial render was free of charge, to help Steve envision his finished map before he made a deposit on the commission. The free render started when Steve sent me some of his world-building notes on the lay of the land. 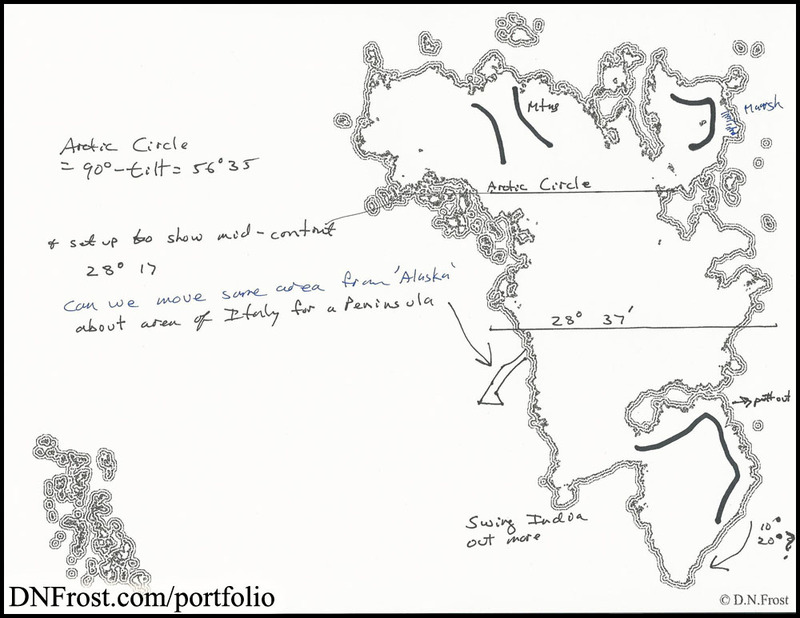 I read through the notes and made a freehand sketch of the continents, then talked with Steve about general shapes of the mainland continent and the island archipelago. Armed with knowledge, I made the first render of Steve's map! After Steve saw the preliminary render, he printed out the render and sketched his first adjustments right onto the map, then scanned it and sent the image back to me. At this point, he paid a deposit for a little over half the total cost, and I began making adjustments. 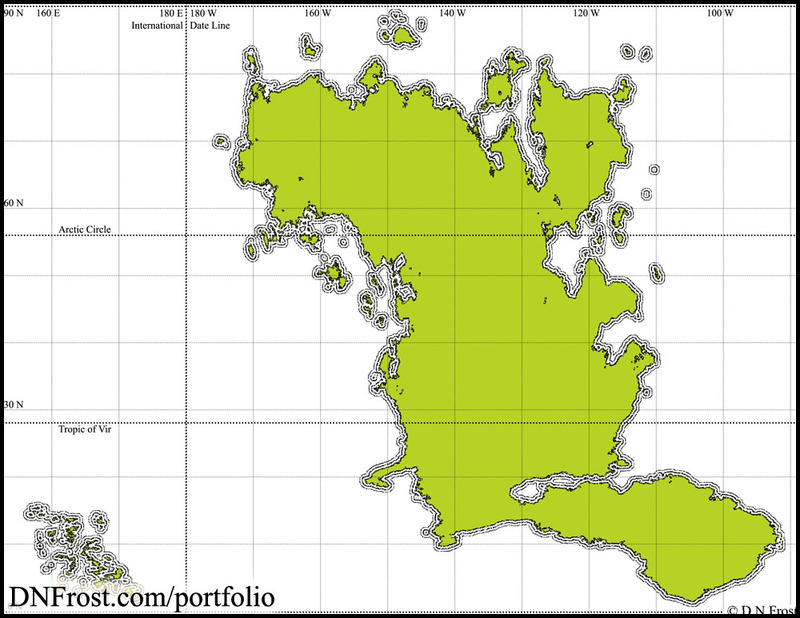 I shifted subcontinents, adjusted islands, and added peninsulas to the original render. Steve provided very particular latitudes for the Arctic and Tropic parallels, but as I worked those lines into the updated map, I bumped into a problem. The temperate zone Steve wanted stretched the continent far beyond the north pole and equator. I sent him an overlay of his continents across a map of Earth to illustrate the issue, and I provided a few options for different solutions. 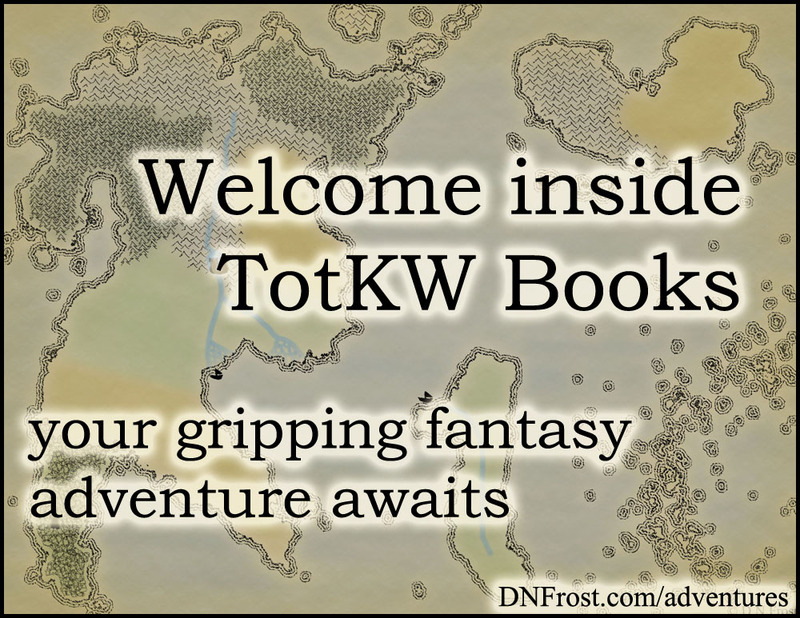 Steve picked the option that worked best for his world, and I shrank the tropic and arctic zones into proportion for the temperate zone he wanted. Not surprisingly, the shape of the whole continent changed drastically. I added a latitude and longitude grid for Steve's reference and sent him another render so he could decide if he liked the new look. Steve had lots of statistics about his planet that were difficult to translate into a 2D map projection. 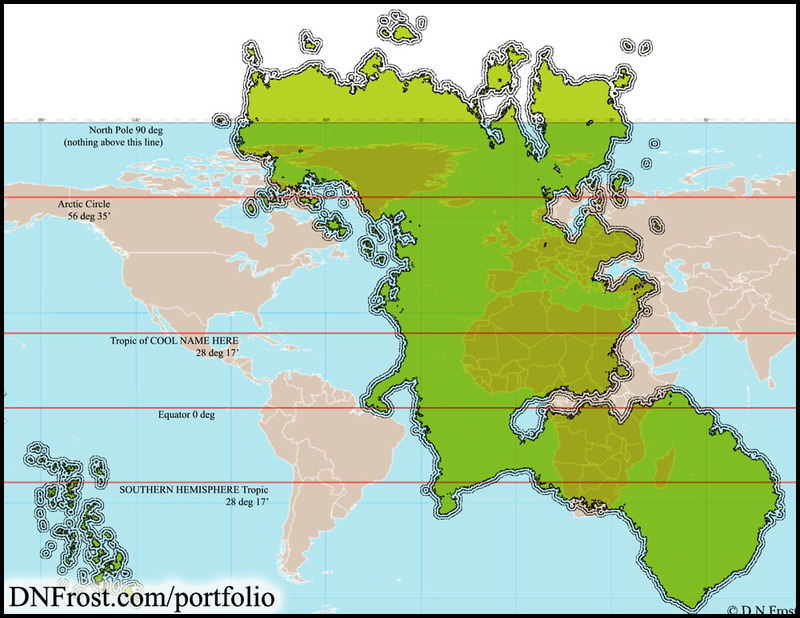 Because all 2D maps distort the land depicted (especially near the poles), we agreed that his 2D map would inherently be a little inaccurate, similar to my Maps of the Known World. Fortunately, that meant it wouldn't contradict his data on miles of coastline, total land area, and percentage fresh water. He liked the new render, and we were ready to move on to the next stage of his map.